The Palestinians' situation is terrible. Three fourths of their population live in poverty. The number of poor has tripled since September 2000 and over half the workforce is unemployed. Palestinians are more dependent on food aid than ever before. Reports for 2003 from social welfare organizations note "pervasive and deepening poverty," "worsening conditions and an economy in a state of ruin," "conflict creating a major humanitarian crisis," and "widespread psychological trauma." Palestinian Prime Minister Queri has understated: "Our people are suffering." President George Bush and other world leaders have lamented the sad plight of the Palestinians. Something beyond talk is needed to alleviate Palestinian suffering. "Tell Bush: Good Speech! Now Take Action," suggested the Jewish Voice for Peace, urging Bush "to back his words with action." Refugees International has called on President Bush to "take steps to give jobs, education, medical services, and food." In describing the talking-versus-doing syndrome, Herbert Hoover, President of the United States from 1929-33, said in 1920: "Words without actions are the assassins of idealism." Hoover could never be accused of assassinating idealism: he was responsible for the rescue, feeding, clothing and resettlement of more victims of natural disaster and war than just about anyone in history. During World War I, he headed the Commission for Relief in Belgium, which fed 10 million people and carried out Belgian postwar reconstruction. 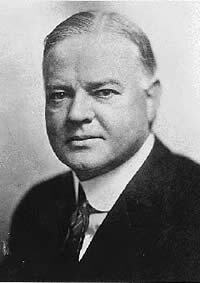 In 1917, Hoover served as US food administrator. After the war President Woodrow Wilson sent Hoover to Europe to direct the American Relief Administration. In 1927, as Secretary of Commerce, he successfully resettled 325,000 Americans rendered homeless by the Mississippi River's flooding. After World War II he brought relief to millions as Coordinator of the European Food Program. As a Quaker, Hoover passionately believed in peace, was appalled by the human costs of war, and devoted his life to public service. Even with his most grandiose projects, he kept the worth of the individual paramount. His title, "The Great Humanitarian," was well deserved. When war again broke out in Europe, Hoover, now in his 70s, established the Polish Relief Commission, which fed 300,000 children in occupied countries. He became chairman of the Famine Emergency Commission and in 1945 President Harry S Truman asked him to organize food relief for war-torn countries. Nor did the plight of the Palestinian Arabs escape The Great Humanitarian's attention: In December 1945, he submitted his plan to the Anglo-American Committee of Inquiry on Palestine. Hoover said it was "a process by which both Jews and Arabs would benefit materially," and could be instrumental in "settling the Palestine question and providing ample Jewish refuge." He insisted that it offered a "constructive humanitarian solution" and the committee agreed that the proposal merited careful study. What Hoover proposed was "that Iraq be made the scene of resettlement of the Arabs from Palestine" and this for their immediate relief and long-term benefit. Unlike current proposals for mass, forced transfer, there was an implicit assumption that this one would be totally voluntary. By 1949, with the creation of half a million Palestinian refugees, Hoover's plan took on special urgency. He wrote the White House that "they are in a deplorable condition," and they can be absorbed in Iraq. "It would give permanent solution to the problem of these unfortunate people," Hoover said. He also said his plan "would strengthen the economy of Iraq." Could Hoover's vision work today? The population of Iraq this past generation has been decimated. The prolonged Iran-Iraq War of the 1980s, the internecine fighting within Iraq, the 1991 Gulf War, the subsequent U.N. sanctions, and the most recent U.S.-led invasion and occupation have taken a toll of millions of Iraqis. Resettling the downtrodden Palestinian Arabs in Iraq would alleviate their suffering and be a concomitant blessing to Iraq. Palestinian Arabs excel in agriculture and construction, the areas of war-torn Iraq's greatest need. Jimmy Carter warned recently that "the lack of real effort to resolve the Palestinian issue is a primary source of anti-American sentiment throughout the Middle East and a major incentive for terrorist activity." Hoover noted his program "would contribute to a friendly gesture from the West to all Arab countries." The idea of Jordan as a Palestinian state is widely supported on the Israeli right, even though it is vigorously resisted by the Jordanian monarchy and people. The notion of Egypt as a partial homeland is strongly advocated by the leader of the National Religious Party and others, even though it is firmly rejected by the Egyptian authorities. However unrealistic reviving Hoover's idea may appear at first glance, it seems far more realistic than those relatively widely endorsed approaches. The main obstacle to implementing Hoover's plan has been the presence of antagonistic regimes in Baghdad. Today, American control of Iraq presents a unique opportunity. Let's remember: "words without actions are the assassins of idealism." Bruce Brill is an independent journalist living in Kfar Eldad which is in Northern Israel.